While the new year has just dawned, New Hampshire legislators will be back to work today, as the state’s legislative session begins this first week of 2018. 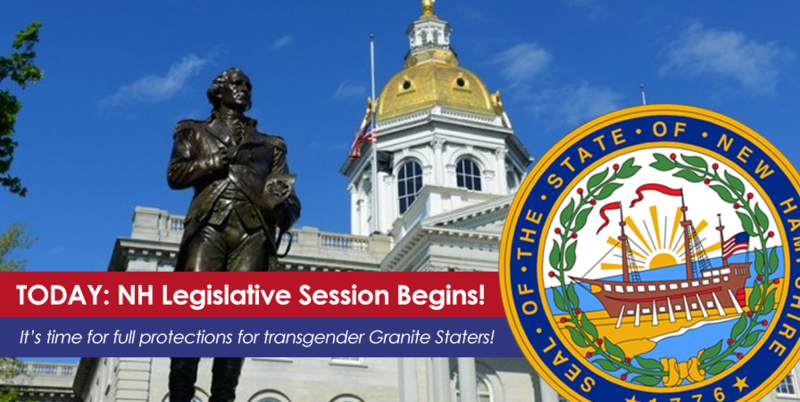 #TransBillNH, filed as House Bill 1319, will be assigned to the legislature’s Judiciary Committee for review. Recent developments regarding the bill have increased the momentum to pass it through the legislature and bring it to a vote. On December 14, Governor Chris Sununu announced the formation of a committee tasked to investigate ways to prevent discrimination, including that against transgender people. Additionally, Attorney General Gordon McDonald announced the creation of a specific Civil Rights Unit in the state’s Department of Justice. The chair of this unit, Elizabeth Leahy, mentioned violence and discrimination against transgender people in her introductory remarks, making clear that preventing such actions in the future will be among the department’s priorities. Furthermore, the legislature’s Children’s Caucus delivered its influential endorsement of the bill on December 13 by a vote of 14-1, becoming the first caucus to officially endorse our campaign for passage. For 20 years, lesbian, gay and bisexual people have been protected by law in the Granite State. However, there is still a lack of inclusive protections for transgender people. In 2018, the legislature has the chance to change that by passing House Bill 1319 and delivering it to Governor Sununu’s desk for his signature. Already, 18 states and more than 200 cities have passed such legislation. New Hampshire has an opportunity this year to join them by making the state’s nondiscrimination laws fully comprehensive, and ensuring that transgender people are offered protections in housing, employment, and public accommodations. To follow the latest in New Hampshire and learn the state’s history of non-discrimination, click here.